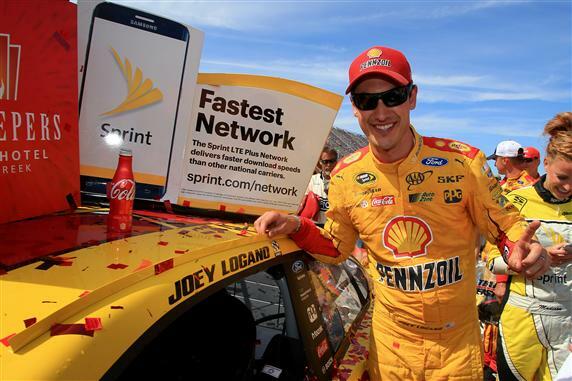 BROOKLYN, Mich. – In the second race that featured NASCAR’s new lower-downforce package, Joey Logano lowered the boom—again. There was one major difference between Joey Logano’s victory in Sunday’s FireKeepers 400 at Michigan International Speedway and his win May 21 in the Sprint All-Star Race at Charlotte. This one counted in the NASCAR Sprint Cup Series standings and punched Logano’s ticket into the Chase. But it remained abundantly clear that Team Penske already has a handle on the aerodynamic configuration the sanctioning body is considering for 2017. Logano led 139 of 200 laps at the two-mile track and dominated a succession of restarts, except for one instance on Lap 117 when race runner-up Chase Elliott grabbed the lead from the driver of the No. 22 Ford. Reasserting his superiority on a Lap 154 restart, Logano held the top spot the rest of the way to win for the first time this season, for the second time at Michigan and for the 15th time in his career. It was the 50th victory for Team Penske since switching to Ford equipment after the 2012 season. The top three finishers boasted the youngest average age for a podium in Sprint Cup Series history–23.0. Logano is 26, Elliott 20 and Larson 23. The previous youngest average age for a top three was 24.7 (three times, dating back to 1951 at Charlotte Speedway). Logano had a comfortable lead over Elliott, the Sunoco Rookie of the Year leader, when Denny Hamlin popped his left rear tire on the frontstretch and careened into the inside wall near the entrance to Turn 1. NASCAR called the ninth caution of the afternoon, setting up the final restart with seven laps left. Logano chose the outside lane, and eventual third-place finisher Kyle Larson tried to push Elliott past Logano into the lead, but to no avail. Logano pulled away, maintained an advantage of nearly one second and won the race by .889 seconds over Elliott, who was chagrined despite a career-best finish in the NASCAR Sprint Cup Series. Elliott’s waterloo actually came at Lap 154, when, as the leader, he missed a shift and allowed Logano to regain the lead. “You can’t do dumb stuff and win these races,” Elliott said. “Completely my fault. The guys gave me a great car today. This whole NAPA group has been working so hard these past few weeks, and that one was on me. Logano’s teammate, Brad Keselowski, ran fourth behind Larson, with Kevin Harvick rallying from a 29th-place starting position to finish fifth. Carl Edwards, Tony Stewart, Austin Dillon, Jamie McMurray and Kurt Busch completed the top 10. The seventh-place result for Stewart was his second-best this season. Stewart missed the first nine events of the year after an offseason back injury. Larson’s No. 42 Chevrolet failed the laser inspection station (LIS) after the race. NASCAR is taking the car to its research-and-development center in Concord, N.C., for further evaluation. If penalties are warranted, they will be announced in the coming week.